Inspired by industrial artefacts, mythical and archaeological imagery, and marine animals from sea hares and rotifers to barnacles, Jacek Wankowski explores the abstraction of the internal and external surfaces of living things in his first solo exhibition. 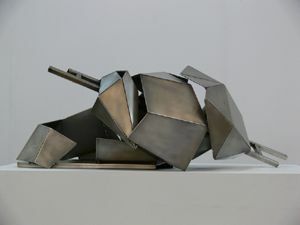 His steel sculptures play with space and hollow forms, creating tension between their component parts. âReef' a 2.5 m high and 4 m wide sculpture dominates the sculpture forecourt. Five smaller sculptures feature in an accompanying exhibition based on the same theme.